Bewitched is an odd word with which to begin a chemical textbook. Yet that is a fair description of how I reacted on first leaming of ion exchange and imagining what might be done with it. That initial fascination has not left me these many years later, and it has provided much ofthe motivation for writing this book. The perceived need for a text on the fundamentals of ion chromatography provided the rest. 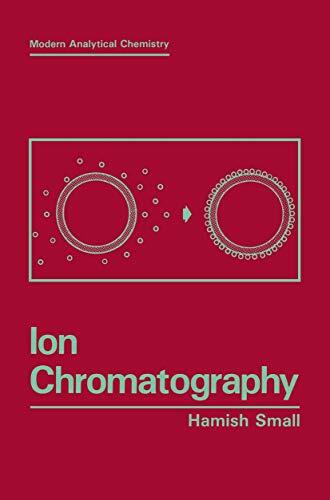 Many readers will have a general idea of what ion chromatography is and what it does. Briefly, for those who do not, it is an umbrella term for a variety of chromatographie methods for the rapid and sensitive analysis of mixtures of ionic species. It has become highly developed in the last decade, and while it is now routinely used for the determination of organic as weH as inorganic ions, its initial impact was greatest in the area of inorganic analysis. In the past the determination of inorganic ions, particularly anions, meant laborious, time-con­ suming, and often not very sensitive "wet chemieal" methods. In the last ten years that has changed radically as ion chromatography has supplanted these older methods. 1 Introduction.- 2 The Chromatographic Process.- 3 The Materials of Ion Chromatography.- 4 Ion Exchange in Ion Chromatography.- 5 Ion Exchange Resins in Liquid Partition Chromatography.- 6 Detection—General.- 7. Conductometric Detection.- 8 Other Modes of Detection.- 9 Selected Applications of Ion Chromatography.- Appendixes.- Appendix A. Logarithmic Diagrams.- Appendix B. Limiting Equivalent Conductivities of Ions at 25°C.- Appendix C. Conductance of Carbonic Acid as it is Neutralized by Sodium Hydroxide.- Appendix D. Conductance of a Strong Acid in a Background of Weak Acid.- Appendix E. Ionization Constants and pH Values at the Isoelectric Points (pI) of the Common Amino Acids in Water at 25°C.- Appendix F. The Structure of Common Alpha-Amino Acids.- References for Appendixes.